One of the most anticipated games of the year - if it even comes out this year - is The Last of Us Part II from Naughty Dog. From what we've seen so far from the studio, the sequel looks to take what made the first game so great and make it even better. According to one well-known industry name, it's "definitely" coming this year. 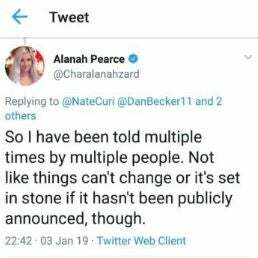 Alanah Pearce, known for her work at IGN and currently Rooster Teeth, took to Twitter to "confirm" that The Last of Us Part II was indeed coming out in 2019. The tweets have since been deleted, but the internet is forever so of course someone managed to take a screenshot. 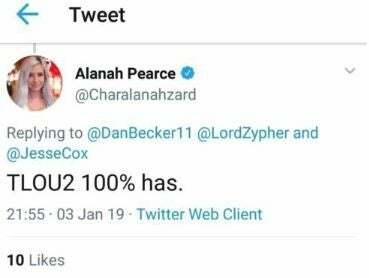 One of her responses was a short "TLOU2 100% has" where another one seemed to go a little more into specifics when Pearce stated "So I have been told multiple times by multiple people. Not like things can't change or it's set in stone if it hasn't been publicly announced though." Though she is correct in stating that it's possible this could change - it wouldn't be the first time - this actually isn't the first time a 2019 release date has leaked. We've seen it with several retail listings, we heard it from Ashley Johnson and Troy Baker during their performance at PSX 2017, and we've seen some rumblings from different analysts also speaking to a nearer release window. Still, as with all things, until the studio themselves make an official announcement take every report like this with a grain of salt. It would be incredible to see The Last of Us Part II release this year, but it's also important to not get our hopes up too high until Naughty Dog themselves confirms the news. What do you think the release date will be for The Last of Us Part II? Are you excited to see the continuation of Ellie's story? Join in on the conversation in the comment section below, or hit me up over on Twitter @DirtyEffinHippy!